At this week's British International Motor Show, Jaguar unveiled three new models including the top-of-the-range XK sports car – the all-aluminium XKR. This uprated V8 supercharged sports car shared its debut with a new XJ Long Wheelbase Diesel and another flagship model, the XJR Portfolio. 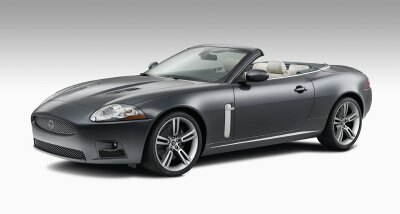 The new XKR captures the essence of what makes a Jaguar XK so special. It inspires drivers of all abilities with confidence thanks to its rigid lightweight body, superb chassis control and grip levels. This combination complements the outright pace of the car, delivering a perfect balance between a GT cruiser and an exhilarating sports car. The XKR's powerful statement of intent is reinforced by its aggressive look; which includes detail such as the enhanced front bumper, bonnet louvres, aluminium-finish grilles, side power vents, unique 19 and 20-inch alloy wheel designs and a chrome-finished quad-exhaust system. Geoff Cousins, UK Managing Director for Jaguar Cars commented: "Since the remarkable success of the new XK, expectations were high for the supercharged version, the XKR. We believe this car will exceed expectations with its great looks and phenomenal driving experience. We have taken more than 800 advance orders for the XKR already which is testament to the XK and proves that the UK market appreciates Jaguar's design and engineering capabilities." Offering a blend of supercharged performance, outstanding dynamic abilities and keen pricing, the XKR has significant advantages overall against both lesser and considerably more expensive rivals. This is the ultimate GT sports car for the real world – if you liked the XK, you will relly enjoy the XKR. Also making its debut at the British Motor Show is the XJR Portfolio, a special edition supercharged performance saloon, inspired by the design cues first seen on the striking Concept Eight show car which starred at the New York International Auto Show in 2004. The XJR Portfolio shares its sporting exterior design cues with the XKR, including sculpted aluminium side power vents, bright mesh grille, chrome-finished exhaust system, polished 20-inch alloy sports wheels and Midnight exterior paint. The interior displays unique luxury combining a modern feel, including the aluminium weave veneer from the new XKR, with a full range of the latest technology – intelligently applied. "This fully equipped, supercharged Jaguar saloon is priced at the same level as competitive V8 entry models which have less performance and equipment," commented Geoff Cousins, UK Managing Director. "This excellent value for money demonstrates why the Jaguar XJ continues to be such a sales success. Since its launch in 2003, the XJ has been the most successful in its sector. The XJ has had a very strong half year – best highlighted by an increase of 53.7% in March versus last year to lead the segment – and of course the car has won numerous awards this year including most recently 'Best Luxury Car' at the 2006 Fleet World Honours." Finally, building on the success of the XJ Diesel since it was introduced in September 2005 Jaguar announces the new XJ Long Wheelbase Diesel which combines all the excellent attributes of the long wheelbase car with the refinement of the 2.7 twin-turbo diesel engine. Customers will benefit from the light aluminium body on the XJ LWB Diesel as it weighs just 1,665 kilos, 350 kilos less than one of its main competitors also unveiled at the show, the BMW 730 LD. In addition, this car offers owners exceptional ride, handling and comfort in a car that is extremely quiet and relaxed. With the launch of two new XJ models, Jaguar was proud to announce that the XJ range is being strengthened with a host of updates and additional features for the new 2007 Model Year series placing emphasis on the 'sporting' credentials of the XJ range. To complement the graceful looks of the all-aluminium XJ, Jaguar's design team have devoloped a distinct palette of new exterior colours and interior trim options (Elm Gloss and Satin American Walnut) to ensure increased choice for customers. Furthermore, 19- and 20-inch alloy wheels and a bright mesh grille are now offered as standard on all XJ models, sending a powerful visual statement to match the power and performance of the XJ's four available engines. Inside the XJ there will be a new range of trim and veneer options to provide a luxurious yet contemporary feel, while Bluetooth phone connectivity and heated front seats will be standard across the range. The car will contain a series of state-of-the-art, user-friendly, optional technology systems such as a rear-seat entertainment system or JaguarWatch – a satellite-based anti-theft device – that make the new XJ as advanced as it is beautiful. Also available as an option is an Audio Connectivity Module that allows in-car use of digital music players. Joining these new models on the new-look Jaguar stand is an S-TYPE 2.7 Diesel, the S-TYPE R, an X-TYPE 2.2 Estate and an X-TYPE 2.2 Saloon.